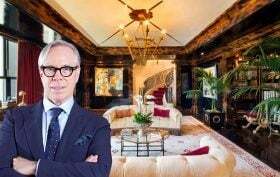 After making several attempts to sell his pad, fashion designer Tommy Hilfiger is relisting his lavish penthouse apartment in the Plaza for $50 million. 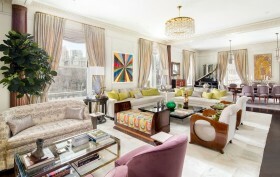 Hilfiger and his wife, Dee Ocleepo, first listed the apartment at 1 Central Park South in 2013 for $80 million. After dropping to $75 million in March 2015 and then $69 million, the most recent relisting had the property on the market for $58.9 million in April (h/t Mansion Global). The couple paid roughly $20 million in renovations for the 5,600-square-foot duplex, which features marble-clad rooms, vintage limestone fireplaces from England and a domed room that features a custom-designed “Elouise” mural designed by the children book’s illustrator Hilary Knight. The Astor Suite at the Plaza Hotel and Residences at 1 Central Park South just hit the market for an Astor-worthy $39.5 million. 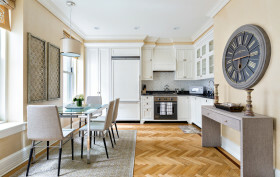 The listing calls the 4,284 square-foot, three-bedroom home “one of the most historic homes ever to become available in the United States.” Currently owned by Esprit founder and former CEO Jürgen Friedrich, the suite boasts a roster of past residents that includes John Jacob Astor, the Duke and Duchess of Windsor and John F. Kennedy. All-American fashion designer Tommy Hilfiger bought three separate condos in the Plaza in 2008 for a combined $25 million. He and his wife Dee Ocleppo then embarked on a very internationally influenced, $20 million renovation that combined the units into one opulent, 5,600-square-foot duplex, complete with marble-clad rooms, vintage limestone fireplaces from England, and a domed room inside one of the building’s iconic turrets that features a custom-designed “Eloise” mural by the books’ illustrator Hilary Knight. The couple listed the apartment in 2013 for $80 million, but despite its lavish interiors, it’s been on and off the market since then, its price dropping to $75 million in March 2015 and to $69 million a few months ago. The Wall Street Journal now reports that it’s reappeared with even sharper discount, dropping 26 percent to $58.9 million. A gracious layout, unique pre-war details–including the signature bathroom finishes–and amenities unmatched in any Manhattan building make this one-bedroom condominium in the legendary Plaza Hotel and Residences at 1 Central Park South as enviable now as ever. Currently asking $2.389 million, this perfectly maintained apartment offers all the cachet of Plaza living and every modern convenience. The home’s floorplan–offering a spacious entry foyer and a huge living/dining space–could even handle the addition of another bedroom or any number of alternative configurations. The unit faces the garden, and oversized windows allow warm light to infiltrate every corner. 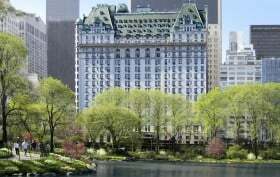 The Plaza, New York City’s iconic 109-year-old hotel and residence (formerly known as the Plaza Hotel) at 1 Central Park South will head for the auction block next month, says Bloomberg Business. An unnamed source claims the storied hotel will be offered in a foreclosure auction on April 26 along with the Dream Downtown hotel in Chelsea. The two mortgages total about $500 million, according to the report. The 4,000-square-foot Plaza suite that Frank Lloyd Wright once briefly called home just got a price reduction (and a broker change) from $39.5 million to $26 million (h/t Curbed). As 6sqft discovered last year, Wright lived in the corner apartment from 1954 to 1959 while he was working on the Guggenheim Museum. Though the architect’s past residency certainly adds interest, the impressive pad at 1 Central Park South does a fine job impressing us on its own—and we’re not alone, clearly, since the home was featured in Architectural Digest in 2014. Current owners James and Lisa Cohen (chairman of Hudson Media and home editor at DuJour magazine, respectively) bought the sprawling condo for $13 million in 2009 to use as a Manhattan pied-a-terre (their main residence is in New Jersey). Then they proceeded to gut-renovate and redesign the home with help from Louis Lisboa of VL Architects and interior designer Susanna Maggard. 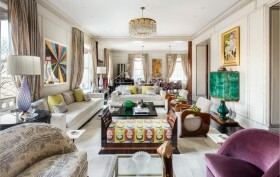 The apartment headed back to the market last year for a renovation-reflecting $39.5 million. Now the colorful, luxurious and impossibly large four-bedroom pad is asking a significantly slimmer but still sizeable $26 million. Did you know that Frank Lloyd Wright was once a resident of The Plaza? Neither did we! The Post reports that the 4,000-square-foot pad the prolific architect briefly called home has just hit the market for $39.5 million. Wright lived in the corner apartment of the storied building from 1954 to 1959 while he was working on the Guggenheim Museum. The location right by Central Park—and a 30-minute walk from the site of his iconic creation—must certainly have bode well for the architect’s creative juices. 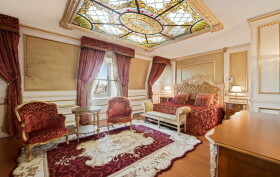 This troubled triplex penthouse at The Plaza just can’t seem to catch a break. It’s been a steady fall from grace ever since 2008, when an unhappy buyer who bought the $53.5 million place sight unseen sued for his $10.7 million deposit plus damages, claiming the home was misrepresented. Well, London-based developer Christian Candy purchased the pad for a comparatively dirt cheap $25.4 million in 2012 and tried to sell it for $59 million a couple of times in 2013. Now the plagued penthouse is back at the same $59 million asking. There’s something to be said for consistency. Let’s just hope the stars align this time and this “townhouse in the sky” finds an owner. Daniyar Nazarbayev, the ultra-rich nephew of Kazakhstan President Nursultan Nazarbayev, is now leasing his equally ultra-luxurious four-bedroom at The Plaza Hotel for $55,000 a month, reports the NYDN. The beautiful 4,200 square foot home is certainly of a presidential caliber and comes dripping with the ornate features and finishes that have become so synonymous with the storied Plaza. With sunny Central Park views from every room and expansive north and west exposures, this home also hosts ceilings highlighted with mosaic stained glass and crystal chandeliers, artistically detailed moldings, a formal dining room, marble entry foyer, and much more—including a helluva lot of international drama to boot. Just weeks after Tommy Hilfiger put his Plaza Hotel estate up for sale, another one is following suit, asking an astronomical $49.5 million, nearly triple the amount it was purchased for back in 2008. However, as ambitious as the price may be, this three-bedroom condo is pretty spectacular. The 3,413-square-foot Art Deco residence has exquisite details, 13-foot ceilings, and stellar views of Central Park—including those of the pond and Gapstow Bridge—from every major room.